It's Time to Head for the Mountains. But, how do you actually get to your favorite ski and snowboard resorts? As locals, we have learned the ins and outs, and do's and don'ts when traveling to and around the Green Mountain State. We are here to help you get to Vermont in just 3 easy steps! Step 3: Grab your skis and boards, pack your bags and get ready for an amazing time in the Green Mountains. Most of Vermont is accessed by four major Interstate Highways. Interstates 87, 89, 91 and 93 all provide easy access to Vermont. Don't stress about the journey, there are plenty of CITGO stations across New England to help fuel your trip. In addition to the Interstate system, Vermont features a well-maintained network of local roads and State Highways. US Routes 2 and 7 provide convenient access points east to west and north to south respectively. The state works tirelessly in the winter months to ensure ease of passage through the many networks of roads. Coming from Canada? No problem- check out these tips for crossing the Vermont- Quebec border. If you are looking for a scenic route, make sure to check out the network of Vermont Byways. Route 100, which runs along the valleys of the Green Mountains, is often referred to as the Skiers Highway since many Vermont resorts lie along the famous route. Vermont's ski and snowboard resorts are closer than you may think. You can be at a Vermont resort in 2 hours from Montreal, 3 hours from Boston and 4 hours from New York City. You can calculate your drive time to Vermont ski and snowboard resorts here. If you do not have a car, you can also get to Vermont by Megabus, Greyhound or even the Jitney. Check with the resort you are visiting to see if they have any specific bus offerings or tour groups. Make sure to check your directions as some roads close for the winter season and we don't want you to end up in the wrong spot! There are many ways to fly to Vermont and the Northeast. If you are visiting a northern or central resort, Burlington International Airport (BTV) is a great option. Direct service is available to BTV from Atlanta, Charlotte, Chicago, Detroit, Newark, New York City, Philadelphia, Toronto and Washington, DC. Vermont ski resorts can also be accessed from Montreal, Canada (YUL), Albany, NY (ALB), Manchester, NH (MHT), Hartford, CT (BDL), Boston, MA (BOS) and New York City (JFK & LGA) airports via a rental car, bus, rail or shuttle service. In addition to major airports, Vermont has several smaller airports near resorts for a more personalized experience. Ski Vermont Pro Tip: If you are flying internationally, spend a day or two in Boston, Montreal or New York City. Vermont skiing and snowboarding is an easy drive from these locations. Amtrak offers two routes with daily service to Vermont. The Ethan Allen Express provides daily service between New York Penn Station and Rutland, VT. This train provides great access to southern and central Vermont. The Vermonter provides daily service between Washington, DC and St. Albans, VT via Philadelphia, PA and New York City and then heads through Connecticut and Western Massachusetts completing its journey through scenic Vermont all the way to St. Albans near the Canadian border. 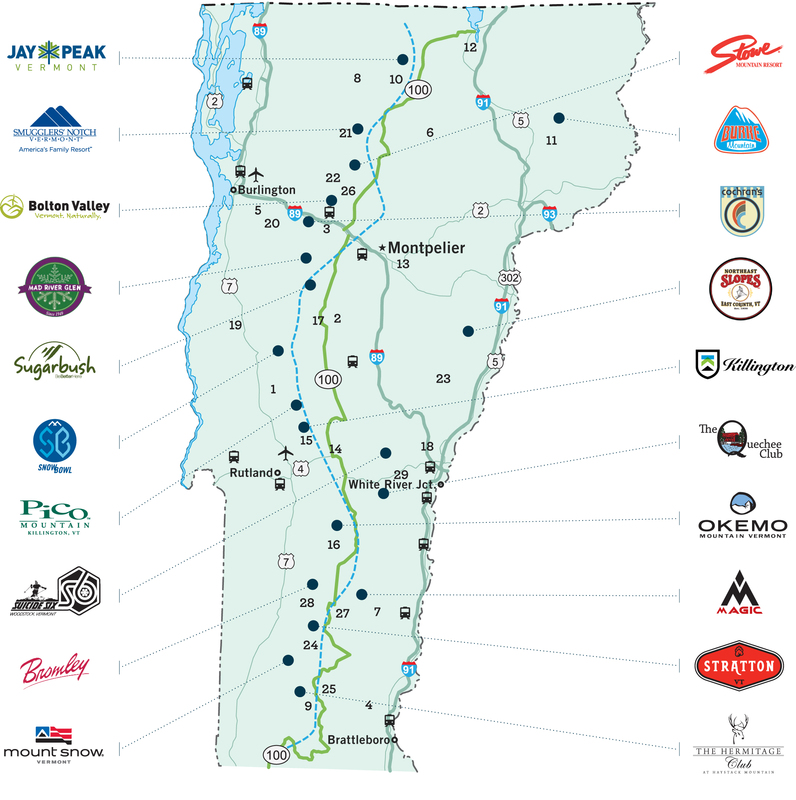 The Vermonter provides access to almost every resort area in Vermont. Ski Vermont Pro Tip: Call your resort ahead of time to find out the best way to get to and from the train stations. Resorts provide shuttle services or can recommend transportation. We bet you never even knew that you could get to Vermont by water! Vermont's Lake Champlain Ferries have been providing safe passage across Lake Champlain since 1826. Some routes are seasonal, so be sure to check which crossing you will be using before you leave on your trip. Ski Vermont Pro Tip: If you are traveling on I-87, the ferries are a unique way to get across the lake into the Green Mountains- just make sure the ferry you want to use operates in the winter and at the time you plan to cross. We recommend calling your chosen resort’s customer service phone number and/or visiting their travel webpage for extra tips on traveling. Have a group of 30 or more? Contact groups@mountsnow.com to arrange bus transportation from many major markets. Coming from New York City? Make sure to check out the Stratton Jitney. Magic is just a short distance from US Route 7 and Interstate 91 in southern Vermont. Heading to Manchester, VT? Bromley Mountain is right up the street. Okemo Mountain Resort offers round-trip shuttle service from 3 local transportation hubs: the Southern Vermont Regional Airport and the Rutland Amtrak Terminal in Rutland, VT, and the Bellows Falls Amtrak Terminal in Bellow Falls, VT.
National flights arrive and depart daily form Lebanon Airport only minutes from The Quechee Club. Suicide Six is just up the road from the Woodstock Inn, which Forbes featured in their magazine as one of the key destinations in New England. There are bus services to Killington Resort from both Boston and New York City in the winter. Pico is just a short drive from Killington Resort. Make sure to check out this local favorite. There are many worthwhile places to stop along the way to Mountain Top, so don’t hesitate to call and ask for local suggestions. Addison County Transit Resources (ACTR) runs regular shuttle service between the town of Middlebury and the Snow Bowl from Christmas Eve until March 1st, with weekend service continuing until March 31st. If you're looking for a scenic ride, take Route 107 to Route 100 off Interstate 89 Exit 3. Follow Route 100 North to Sugarbush Resort. Make sure to check out the NEW Appalachian Gap Cam to see current road conditions heading to Mad River Glen. Burlington International Airport is only a 30-minute ride from Bolton Valley. Make sure to check out the new arrival guide before you hit the slopes. The Trapp Family Lodge is only a 45-minute drive from Burlington International Airport. The historic Smugglers' Notch Pass, on Route 108 between Stowe and Jeffersonville, is CLOSED FOR WINTER TRAVEL from mid-October through mid-May and is closed to motor coaches, motorhomes and commercial vehicles year-round. Traveling from Canada? Check out Burke's Canadian Travel Tips. Jay is the closest resort to the Canadian border. If you are coming from Canada, the closest border to Jay Peak is North Troy/Highwater. Need some additional guidance? Give us a ring at 802-223-2439 and we'll help steer you in the right direction. This travel page is brought to you by CITGO and Amtrak.